Early on the morning of December 1, hundreds of enthusiastic students were gathered at Hugh Dempster Pavilion for some breakfast and a great day of hacking. This was UBC Local Hack Day, open to all passionate hackers. At the end of the hackathon, students came out with cool projects, new friends and more knowledge about technology. A hackathon is an event where people come together to collaboratively build a program or application in a short amount of time. 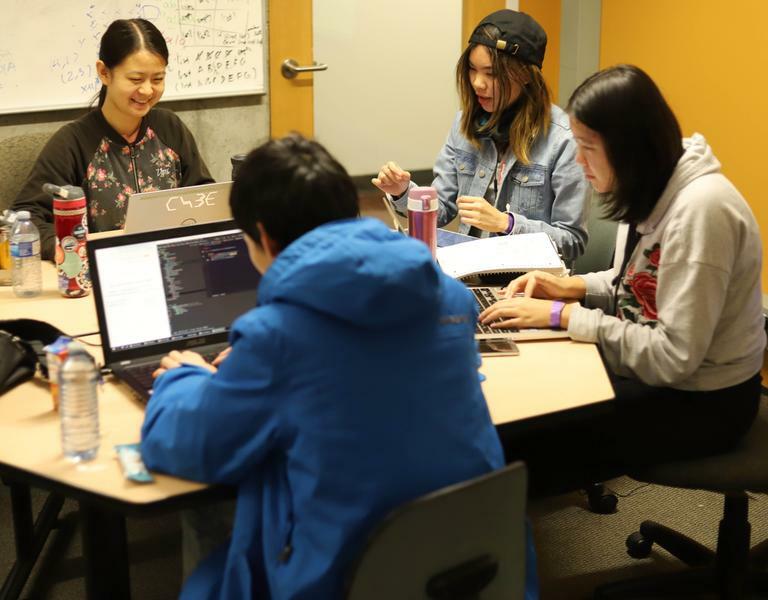 Hosted by NW Plus, Local Hack Day is a global event organized by Major League Hacking where students gather in hundreds of schools all around the world for 12 hours of hacking. The theme of this year’s hackathon was diversity, inclusivity and accessibility. One of the organizers of the UBC event, Allison Chiang, described how the theme pertains to real world issues and promotes discourse in the community. “They came together and thought about ‘Okay let’s sit down, and let’s think about inclusivity [and] how to make things accessible for other people,’ and I think that discussion that was taking place was very important, especially for the tech industry in Vancouver,” said Chiang. The hack day began with an opening ceremony, where sponsors shared a few words with the audience. The students were then free to find a place anywhere in the building to construct their projects. In the middle of the hacking, there were two workshops that took place. The first was hosted by a Slack engineer Conrad Muan, in which students were able to build a simple bot in Slack that interacted with the user. The second was more informational, where NextBillion CEO Naitik Mehta highlighted the interconnection between programming and the real world. He described the importance of being aware of problems and issues, and how your project should be a reflection of these issues. The hackathon was beginner-friendly, with simple workshops that would be accessible to those with less experience. The organizers “[tried] to be inclusive of new hackers that are coming in [who] don’t necessarily have a lot of experience or have a portfolio already set up,” said Chiang. In fact, this was the first hackathon for one of the members of the first-place team. Charmaine Lee, another event organizer, detailed how Local Hack Day was started after “ … [they] saw that there was always a discrepancy between males attending hackathons [and] between females.” The hope is that by catering towards beginners, a more diverse group of people would feel comfortable attending. At the end of the day, everyone gathered in the Hugh Dempster Pavilion auditorium to see demos of student projects, which included an application that filtered out non-inclusive words, a program to address allergies within restaurants and a tool that helped people with disabilities operate a keyboard. The atmosphere was buzzing with conversation, innovation and new ideas. The winning team created a program called emoci, which was designed to help people with hearing loss experience emotion when watching a video or show. When playing YouTube videos, the program displayed emojis alongside video subtitles, conveying the overall mood and emotion of the characters. If you enjoyed this hackathon or didn’t get the chance to attend, you can definitely check out the next one coming up this January.